One of Ralph’s requests for his birthday was skinny ties. They are surprisingly hard to find — either too long or too expensive for a 13-year-old’s wardrobe. So a few weeks ago, I had an idea: I would buy some old fat ties at a thrift shop and take them to a tailor to have them altered. Brilliant, right? But then, of course, I forgot about the idea till 3 days before his birthday. At which point, I tried to rush and make it happen. I found 5 great ties at Goodwill and sped them to the tailor. There, I was told it would take 10 days and cost $37 each to skinny them up. Blech. But since I had the ties in hand, and since they only cost $1 each, I figured I’d try it myself. If I failed, oh well, a $5 failed project is not the end of the world. As it turns out, the first one ended up great (it’s the silvery striped one above)! 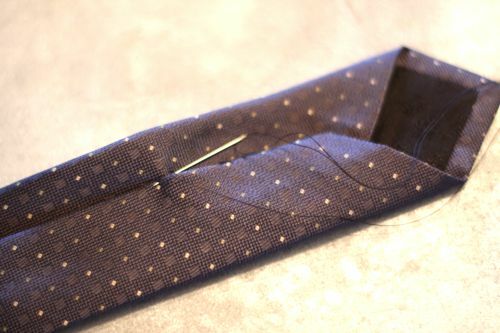 So I took pictures while I remade tie number two — and now I can share the instructions with you, in case you’re curious. 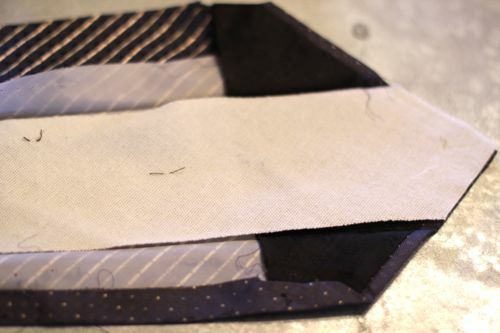 2) Pull the tie form fabric out of the lining (there is probably a real name for this, but I don’t know what it is). This is the piece of the tie that helps keep the tie shape. -Three of the ties I worked with were silk. One was wool. One was polyester. 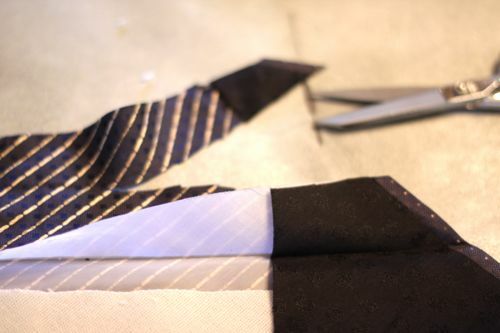 The silk ties were by far the easiest to work with. -Ralph LOVES his new ties. I hope you enjoyed the tutorial. Happy sewing! I love it! Amazing re-do! What a fun project. I am glad they were a success. I just had to laugh when I saw that skinny ties are back in with guys now. When I was serving as a missionary, about 7 years ago, “fatty” ties were all the rage. Ah, the fickle fashion industry! Seven years ago I was too young to know much about ties, but I would guess the popularity of the “fatty tie” has more to do with the fact that everyone is generally more “fatty” than in the 70’s and 80’s when things like skinny jeans were also in. Once all the starving hipsters, whether from being poor or doing too much drugs, started rocking them we realized they just looked better. I think it is an undeniable matter of aesthetics that a person who is in shape is going to look best with a skinny tie while a larger person is going to look silly wearing a skinny tie, and vice-versa. 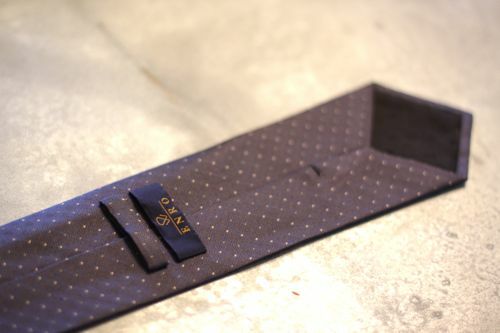 The tie accents the shape of the body by mimicking it. Kind of like how a fitted shirt is inarguably more attractive on lean people because of how it adorns the beautiful shape of the human body. I mean “fatty” ties even start to bulge out towards the bottom much in the same manner as a larger person starts to bulge at the waist and hips. The fashion industry may be fickle, but that doesn’t mean that some fashion trends are more aesthetically sound. Good job Mom! Hope he really enjoys them! This is a great idea! 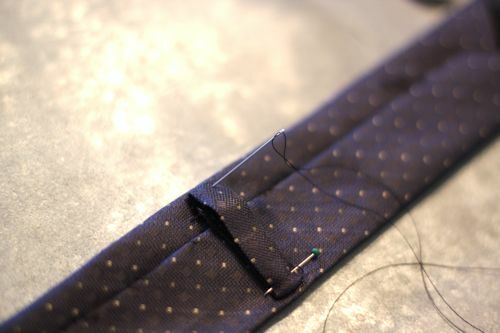 One thing I have noticed on ties that I have hand sewn together for my husband is that the stretching that occurs when he unties his tie often breaks my hand stitching. Just something to keep in mind. I love the polka dot tie. I agree that the reusing of the old ties is terrific. And as for your hand stichting breaking, if you looked at store boughten ties the thread is incredibly thick. It may be a 30 wt if not greater. I’m sure if you are using a thread weight comparable to that used in the industry and are grabbing more than a few threads of fabric with each stitch. Great idea! My husband loves skinny ties too. We find them at thrift stores and estate sales fairly often but this a great tutorial. I’ll definitely give it a try sometime. Skinny ties are back? Glad I kept mine from the 80’s. I just did this last week for my husband. We went to some friend’s 50th wedding anniversary party, which was this amazing sock hop. Anyway, I made the tie for my husband- so he’d at least have SOMETHING to dress up with (as opposed to me- who went all out with crinolines and all). Great tutorial. I love that you encourage your kids’ great sense of style. PS. $37 per tie? Who are these tailors!? I hope you don’t mind if I post about this tomorrow on my blog. I don’t have boys but I could see this working for a more casual look for an adult too! Really good work Gabriel!! Ralph is lucky to have such a crafty mother. that just might very well be simple enough to try! thanks for the instructions. Though not 13, or a fan of skinny ties I admire your creativity. If you know where I can find a smoking jacket & cravat for a 2 month old please shoot me an email… we’ve got a passport photo to take. So many things to love, starting with a 13-yr-old boy who wants skinny ties for his birthday. 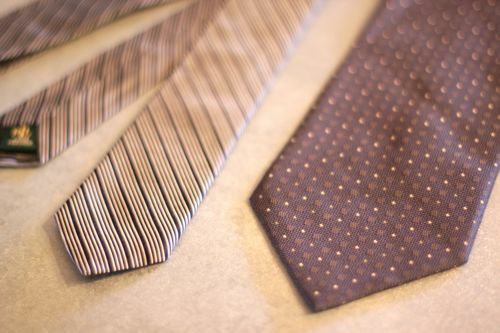 Love the ties you chose and the result – thanks for sharing! I’m not sure which is more cool…the fact that Ralph wanted ties for his birthday or that you were able to make them yourself :) I love this! Awesome! I love that this is something I can do with my limited hand stitching abilities!!!! My boyfriend has an overload of ties he never wears…I bet he would love to have some of them re-vamped into a skinny tie he’ll wear more (of course, I’ll get permission first, heh heh). This is a fantastic tutorial – thanks! also try stitch witchery. 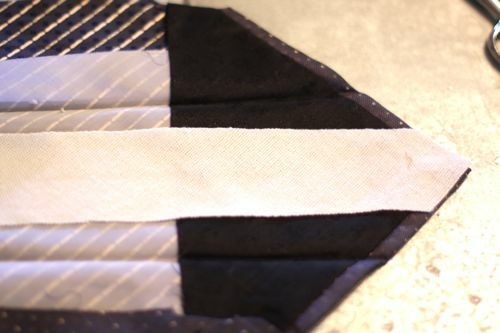 i followed this for some ties and used stitch witchery instead of actually stitching it and it worked fine. time will tell if it holds, but we’ve used it on other things and it worked fine so i expect it to save me this time, too! You know, that’s how Ralph LAUREN got his start – look it up! This is fabulous! I’m going to try it for my 10-yr-old. I hope someday I can be that kind of mom! 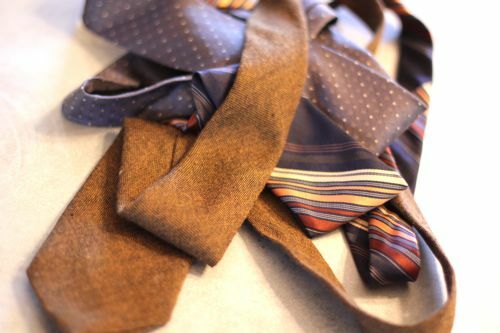 Oooh, those vintage designer ties in my husband’s closet are calling for an update… Great tutorial! Thanks so much for sharing this! Thank you so much for this. My son is only 3 1/2 years old, but I think I might try to make one for him as well. I love that he wanted skinny ties for his 13th birthday-so cool. Way to pull through Mom! Love it! You should totally sew the tags back on – they’re awesome. How many other 13 year olds have YSL ties?!?! Great DIY tutorial! I sometimes do not understand DIY steps for projects. But I can see the process in my mind when I read your instructions. Gifted mother and gifted writer!! This is a great idea! My son is always asking for skinny ties and I have been unable to find any that fit his nine-year-old frame. I’m going to give it a try. I feel certain this is going to be the coolest thing I see all day. Genius is right. Just a great idea. I’m thinking about skinnying some up for my daughter to use as belts – I see such great ties at the thrifts. 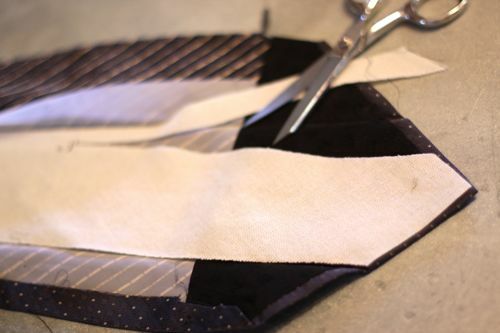 You have done it again, Girl — I’m so excited to tackle tie alterations! 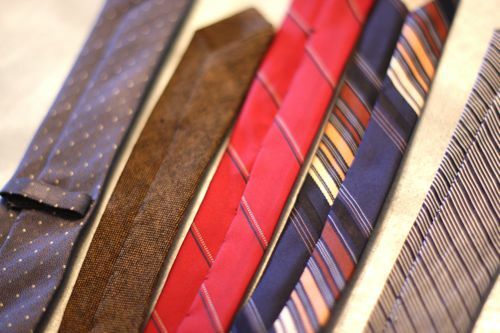 My husband’s new job requires him to dress up more for meetings, and his closet is full of outdated “fat” ties. My 9-year-old begs for ties, too; go figure? So I’m definitely bookmarking this one for future reference. Thank you! What a sweet idea! 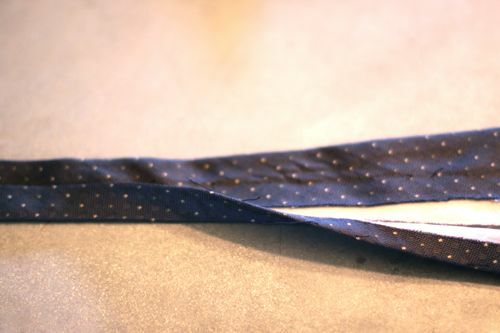 I would love a tie for my one-year-old…I bet I could make a little tiny one with a thrifted men’s tie! Love it! what a clever idea. I’m totally going to do this for my 13 yr. old. He’ll love it. My son would also love these for his end of November birthday…better start now!!! Thanks for the great idea, you make it look so easy! What a fabulous idea! 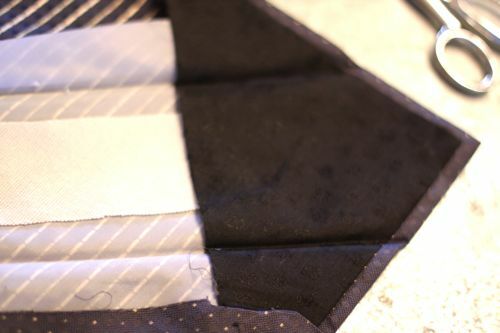 I am featuring this tutorial on my design blog tomorrow – elleapparelblogspot.com. My husband is going to be thrilled! This is great! I love vintage thick ties but my husband likes the thin type. 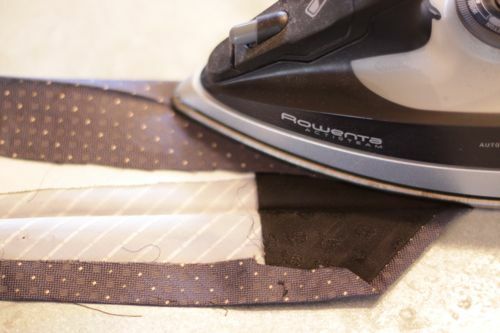 I’ve been buying vintage tie silk from Sew What’s New Fabrics on Etsy to make ties but this is so much easier! Thanks so much! Is there anything you can’t do? Great job! ;) I bet Ralph loves them! Very cool and easy to follow tut. I’ve always liked the look of skinny ties versus fat ones. Fantastic idea! They came out beautifully. first of all how cool is it that your son wanted skinny ties, and secondly that you found some ties at my all time favorite store the G-Dub! I have the name of a great local seamstress for the next time! Very cool project and love the fact that Ralph wanted something so stylish for his BDay!! ooooohhhh love my Rowenta too! My boyfriend loves skinny ties, I’ll definitely try this! Thank you so much for sharing!!! Thanks for the information, idea, and great photos! 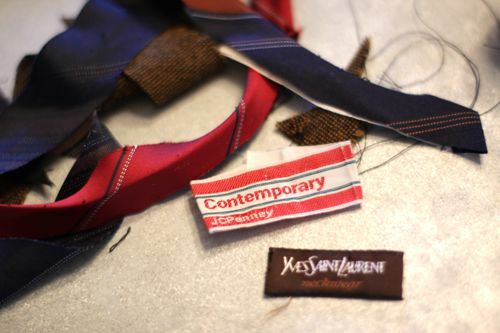 Oh, forgot to mention, the white stuff in the tie is called interfacing. Brilliant! The project, the explanation, and most of all the caring. I hope Ralph knows these are made of love. This is great! Thanks for sharing. I was looking at buying a few but with what I would spend on 1 could get a couple. Also, DIY is life! This is a godsend! My little brother is 13 and has been asking for skinny ties – they’re so expensive to buy for a 13 year old though! I love this! Thank you so much for sharing! THANK YOU SO MUUUCH!!! Skinny ties are oddly difficult for me to find. This is much more efficient. Wow, great job! Wonderful tutorial!!! Thanks – I will try this out. 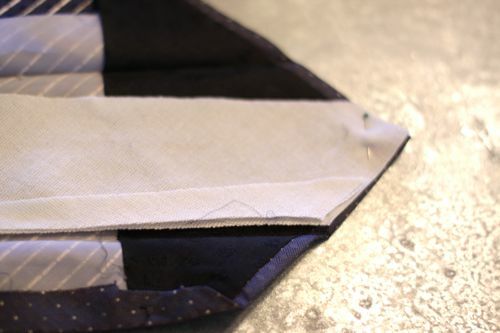 “Pull out the tie form fabric out of the lining (there is probably a real name for this, but I don’t know what it is)” …it’s actually sew-in interfacing. Very good and simple tutorial. 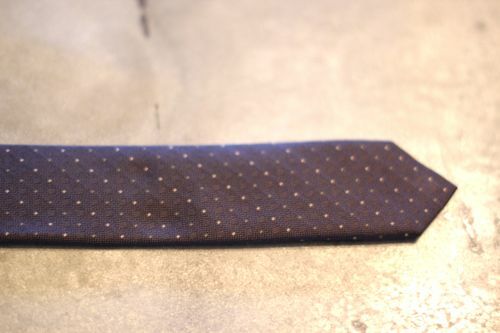 I am planning to make a tie for my brother. This tutorial will help me. Thanks for step by step! I had some issues trimming the edges off, but the tie will work well for my boyfriend’s Don Draper costume! AH! This is so great! What a terrific tutorial! Awesome! Amazing what a needle, thread, and a little love can do. Thanks for the tutorial. God bless you woman. This is the most simple solution and it was right in front of me! Thank goodness you have the sense and the knowhow to do it! I second what Erin said. An obvious tie fix, but I was too dumb to think of it. Good job. awesome! my husband likes skinny ties but they are so hard to find. thanks for this great tutorial!! I love you. This is perfect! Wow, I am going to make some of these from old ties. Plus, I am going to shorten them a little for my 8 yr old grandson who loves ties. Also, Ross has bright Tommy Hilfiger ties for very little, that kids would love. Thank you so much for this post! I just made one and it turned out great. Thanks again. 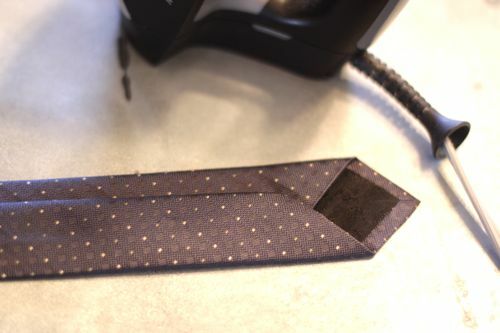 **YAAAY** I made a tie from a tutorial for my hubs for our wedding – which he totally loved — but it was a thicker tie (like traditional) and he likes skinny ties for stuff like dates and wearing with sweaters and stuff, so I’m so glad I found this. 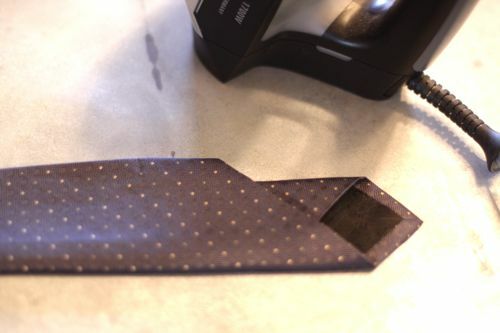 making a tie from scratch only took me about an hour and 20 mins, but I can’t always find good fabric, so NOW I know what to do to save some time and heartache (at not finding a GREAT fabric)!! THANKS! I would love to skinny down some of my husbands fat ties so my boys (11 & 14) can wear them. I’m wondering though; does the length of a man’s tie not have to be shortened to fit a boy? I remember my son trying on one of my hubby’s ties, and you know the “tail” end of the tie that is tucked behind the FRONT of the tie when a man is wearing it? It hung down lower than the front of the tie. Maybe it just wasn’t tied right? Awesome Tutorial, Thanks. Just made some for my husband’s birthday. He’ll be so happy that I made him something new (from his old ties) and didn’t spend any money. 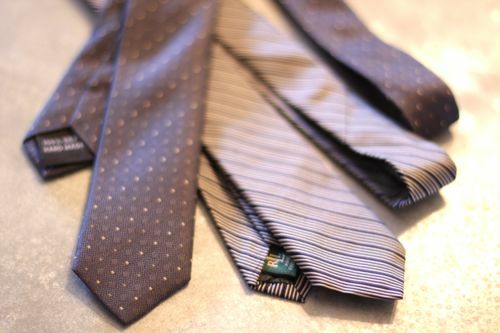 Love those ties, think I will try to convert some of my old fat ones instead of always buying the skinny ones. Great tutorial thanks! I threw an awful lot of large ties away yesterday. N I am seeing this tonight!! For sure, I’ll be trying this. amazing job man. . . .!!!!!!! I love these! They are so great. Skinny ties are so great, and like you said, so hard to find. I love that you have made these out of old ones. I had a hard time making a tie for my father, but this makes it look so easy. Great read. I discovered your tutorial through Pinterest. 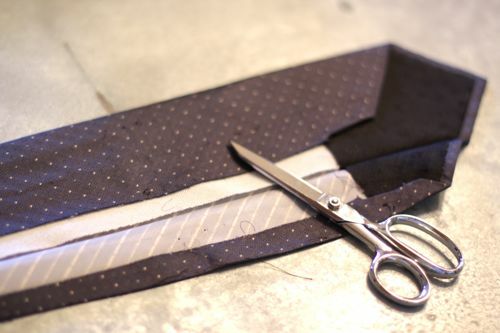 It’s a great idea, not just for “skinny” ties, but also to narrow 4.5″ old ties to a more trend neutral 3″. Thanks a lot for this tutorial, it’s really well made and useful! Btw that tailor is a thief: mine would only charge 9$. 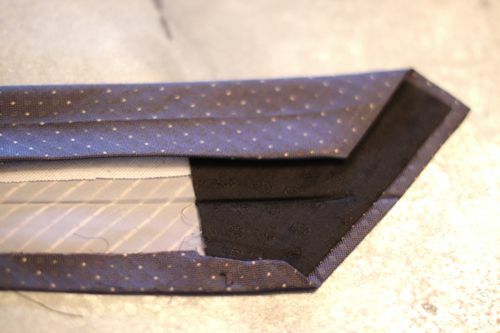 Hello, just wondering if there was an easier way to do this that would utilize the back end of a tie, which is already skinny most of the time anyway compared to the front end which is wider? Great tutorial! Woo-hoo! Thank you for this awesome tutorial!!!! I recently tried it and blogged about it at http://www.becomingwhitney.com . My husband was SO happy to have some of his fat ties converted. And seeing him so happy made me overjoyed. Thank you again! This is such an awesome idea! I could not figure out what to get my bf. and this is the perfect gift! This tutorial is lovely! I have one question, though… Where did you go to get a YSL tie for $1?? I’ve been looking to buy skinny ties, but I can never find, where did you buy the regular ones for a dollar?? That is an amazing price..
Re-made an old tie from recently deceased grandpa for grandson. Perfect way to wear a beautiful reminder of Gramps! Thanks for the easy-as-pie instructions! I LOVE THIS IDEA! I have to wear ties to work and being a woman that is only 5’4″ tall most men’s ties are too long and too wide. 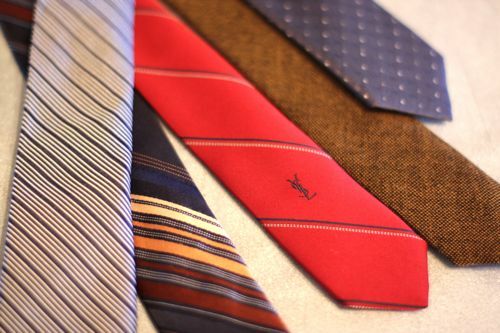 I enjoy wearing the skinny ties, but you are right….they are hard to find. Especially ones that look right for my stature. Best, clearest directions I’ve seen. You’re the Internet article for which I’ve been waiting to trim down some of my wide ties. The pictures totally make the site!